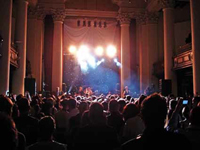 LONDON – The beautiful setting of St John’s Church, situated in the heart of London’s Westminster, played host to BRIT award-nominated The Feeling in part of Capital Radio’s Capitalive Summer Tour in association with Rimmel London. Turbosound’s new Flex Array series were used on the tour. CAMBRIDGESHIRE, England – In September 2006, Peterborough Community Church opened a brand new, 80,000-ft. building in the Cambridgeshire city it is named after. With a technical specification that would be the envy of many large theatres and live music venues, the inclusion of DiGiCo D5 and D1 consoles demonstrated that the church was committed to the future. Twenty months later, the building has a new name – KingsGate Community Church – and its technical team has had many months of using the DiGiCo consoles. KELOWNA, BC – Held at the luxurious Grand Okanagan Resort and Convention Center in Kelowna, British Columbia, the 2008 Telus World Skins Game VIP Gala dinner was hosted by sports agency powerhouse IMG for their sponsors, players, media and VIP clients of this golfing event. With a crew that included FOH Engineer Steve Williams and System Techs Jose Antunes and Matt Perry, Northwest Global provided a system consisting of Martin Audio W8LM and W8LMD Mini Line Arrays with WSX subs; Martin Audio MA 4.2S and MA2.8S power amplifiers with Martin Audio DX1 Speaker Processing. A Midas Venice 320 was also used as the console. 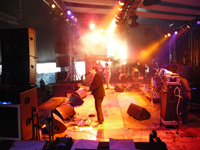 SCOTLAND – ADLIB Audio supplied sound for two stages at the successful T In the Park 2008 festival, staged at Kinross, Scotland; the King Tuts Wah Wah Stage and Slam Stage. Slam Stage’s massive V-shaped dance-orientated tent had a capacity of 20,000. Its shape and scale presented some interesting challenges for ADLIB Crew Chief Hassane Essiahi and his team who worked closely with Sound Engineer Dave Pringle to ensure that all the bands and DJs had the requisite levels of energy and volume to make it rock. HOLLYWOOD, Calif. –Cerwin-Vega! 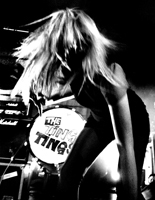 Has announced that it is now the official sound choice of the Hollywood, Calif., venue Cranes Tavern. As a permanent sponsor, Cerwin Vega! outfitted Cranes Tavern with Active Series speaker system. Cranes Tavern is recognized as one of the most enjoyable hotspots for music in the city. The custom install included six CVA-28s, a 3-way active speaker system featuring dual 8” custom-designed Cerwin Vega drivers, which provide tight bass and a clearly defined mid-range. The Electro-Voice DC-One digital loudspeaker system controller, based on a two-in-six topology, is designed primarily for users of small- to medium-sized sound systems in both mobile and installed applications. While the unit is a new development based on a SHARC processor, it is 100% compatible with all settings from other Electro-Voice signal processors, including the Dx38. GLENDALE, Ariz. – When a coyote howls, the world listens. Now, the Phoenix Coyotes NHL franchise at Jobing.com Arena in Glendale, Ariz., can make the same claim. The 17,500-seat arena recently upgraded its sound reinforcement system with a major commitment to L-ACOUSTICS line arrays, subwoofers and amplifier-processors. PILTON, England – England’s Glastonbury Festival is unquestionably Europe’s biggest festival. In fact, there is no event like it anywhere in the world, not only because of the 150,000 visitors who make the pilgrimage to the sleepy hamlet near Oxford. What makes this gathering unique is its countless stages big and small, outdoors and in tents. The three-day festival featured some 500 bands, artists, and DJs representing every conceivable style and genre, among them acts such as Jay-Z, The Verve, Franz Ferdinand, Joan Baez, Leonard Cohen and Massive Attack. DALTON, Ga. – The Electro-Voice XLC127 DVX mid-sized line array continues to prove itself a versatile loudspeaker system, equally at home on the highest-profile rock tours or at corporate events requiring precise coverage and sonic detail. GravelRoad Entertainment LLC (Cleveland, Tenn.) deployed an input-to-output Electro-Voice PA for one such event, the 6th Annual Steak & Stake Dinner at the Northwest Georgia Trade & Convention Center, held recently to benefit the Boys & Girls Clubs of Gordon, Murray and Whitfield Counties. NILES, Ill. – Shure Incorporated has posted several new educational podcasts, called Shurecasts, on the Company’s Web site (www.shure.com/proaudio) and on iTunes that cover the basics of wired and wireless microphones. IRVINE, Calif. – Ultimate Ears has announced that it is reducing the price of the company’s flagship dual-driver UE-5 Pro to better accommodate a larger user base within the emerging artist community. 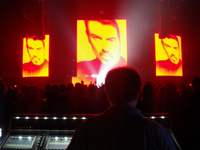 LAS VEGAS – For the first time in 17 years, mega popstar George Michael heads to North America, bringing the smash “25 Live” tour to arenas this summer. In promotion of his latest Twenty Five recording, the North American segment is the third leg of Michael’s worldwide tour, the first two having covered 12 European countries in 80 shows for an estimated 1.3 million fans over the past year.